UNPO: Side Event "Human Rights Violations in Indonesia"
On behalf of the Unrepresented Nations and Peoples Organization (UNPO) and the Nonviolent Radical Party, you are cordially invited to attend the parallel event “Human Rights Violations in Indonesia”, which will take place in Room VIII at Palais des Nations, Geneva, on the 14th of March 2014, 11.30-13.00. Several provinces in Indonesia, such as Aceh, Papua and Maluku, have movements that contest the central power in Jakarta, politically as well as economically and culturally. The national government has over the years imposed an ideology of the unitarian state (NKRI), that has been promoted especially since the dictatorship of general Suharto was toppled in 1998. The appeal in these regions for more autonomy is responded to by the government as treason and severely punished, also if it is completely non-violent political activism. In Maluku and Papua, such activists have been sentenced to ten to fifteen years imprisonment and they have been severely tortured. 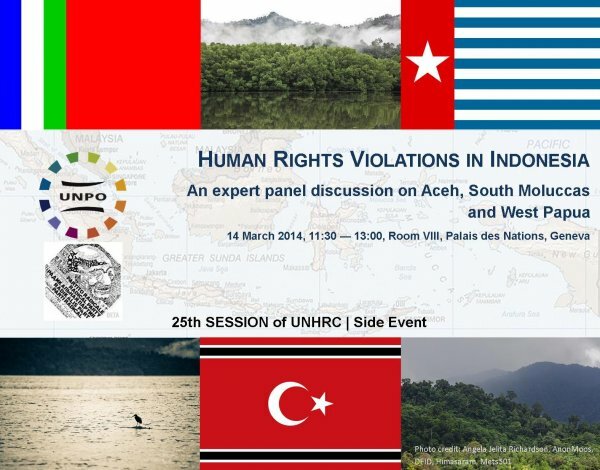 In Aceh a fragile peace agreement has been signed in 2005, but it is only partially being implemented. This harsh approach by the national authorities and abuse of power by security forces and police are detrimental to an open dialogue on the wish for self-determination. Many human rights organizations do not dare to express their views openly, or to support political prisoners. Some others, who did dare, were intimidated and harassed. Legislation for the protection of human rights defenders is lacking. The meeting will provide information on human rights violations in Aceh, Papua and Maluku, on the lack of legal protection of human rights and an exchange of views on possible, non-violent, ways out for a peaceful solution. Ms. Martha Meijer – Independent human rights advisor with longstanding experience in working on Indonesia. One representative each from the RMS, the ASNLF, and West Papua.